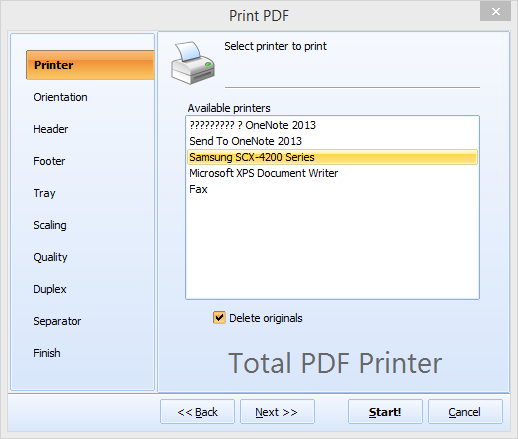 Total PDF Printer is a powerful new software tool for taking control of your PDF printing requirements. It's designed with simplicity of use in mind and few tools out there can compete with the unique mix of power and affordability that it brings to turbo-charging your printing productivity. 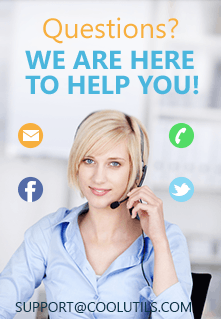 We have put considerable effort into making Total PDF Printer as easy to use as possible. Fans of intuitive graphical interfaces will find the program a breeze to get up and running with and the full range of functionality is also available via the command line for power users. Whether you are processing a single file or looking to perform bulk operations, Total PDF Printer has you covered. You can process multiple files at once and take advantage of a number of intelligent options such as getting the program to output via time or date in order to optimise your workflow and avoid tedious manual sorting down the line. 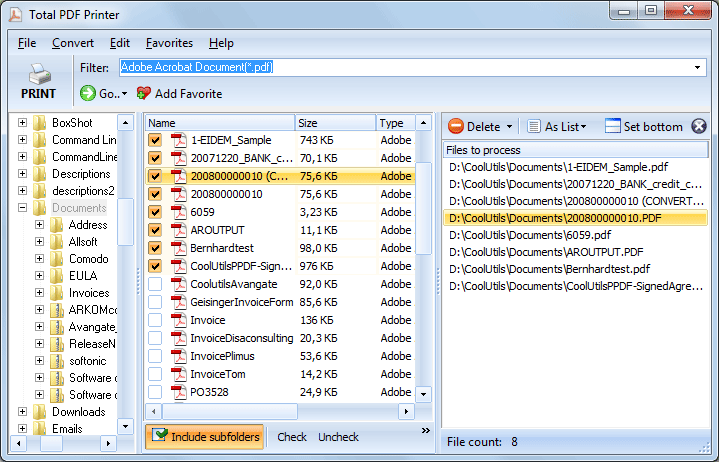 File selection couldn't be simpler in Total PDF Printer. You can kiss goodbye to rummaging around in folders or having to reorganise your source files thanks to its simple and intuitive interface. A straightforward document tree gives you a complete picture of your options at all times and leaves you free to select single or multiple files for output. Once you've selected your document set, you will be steered through a series of options letting you control individual parameters such as the specific output device and tray to target, orientation settings, paper size and print quality. You have also got the option of adding separators or blank pages to give you more control over output and save time sorting when you are finished. Printing is one of those common office tasks that can very easily spiral into a massive timesink if you don't make the extra effort to optimise it in terms of workflow. The simple purchase of one dedicated tool for handling it could have a surprisingly powerful impact on your working week. A special option is there for duplex printing. If you want to print files on both sides of a paper sheet, the app will automaticallu add a blank page to odd-paged documents. Purchase a copy today or take advantage of our fully functional free trial to see just how much time, money and effort Total PDF Printer can save for you and your team.